Trauma refers to a significantly distressing or disturbing experience. Typically, trauma is a word that is reserved for experiences related to abuse, combat or war, or being the victim of a violent action. Traumatic events leave a profound negative emotional aftermath on the people who experience them. These events will often result in damage to the psyche or sense of self that is so severe that individuals may need significant assistance to cope. However, not everyone who experiences traumatic events develops a mental health disorder as a result. In fact, most people who have these experiences do not develop mental health disorders, although many people will find that these events do change them in some way. The increased potential to develop severe emotional distress as a result of a traumatic event has led to the recognition of a potential group of mental health disorders (clinical disorders) that have been identified as associated with the experience of trauma. However, the experience of trauma alone is not enough to lead to a clinical diagnosis of a trauma and stressor-related disorder. As mentioned above, most people who experience traumatic events do not develop psychological disorders. Prior to 2013, most of the disorders that were associated with the experience of traumatic events were classified as anxiety disorders because there was a significant component of anxiety associated with these diagnoses. However, in the DSM-5, the current edition of the Diagnostic and Statistical Manual of Mental Disorders, the American Psychiatric Association (APA) groups these disorders in a separate category from the anxiety disorders. This new category recognizes that even though there are significant emotional components to these disorders, it is doubtful whether they would manifest with the same symptoms if the person had not experienced some perceived trauma. This is because one of the symptoms associated with many of these disorders is the reminiscence or re-experience of the precipitating traumatic event. These disorders are now considered to be more related to obsessive-compulsive disorders and dissociative disorders, where the person’s consciousness – identity, memory, perceptions, and emotions – has been disrupted. Unexpectedness: The perceived traumatic event was unexpected. Little preparation: The person experiencing the event was not prepared for it in most cases. Lack of control: When the event occurs, the individual may feel like they have no control over what is happening to them. Emotional distress: Significant emotional distress or emotional detachment occurred either during or following the event. Other factors that also appear to increase the risk of developing a trauma-related disorder include having a history of some mental health disturbance or disorder (e.g., depression, an anxiety disorder, or a substance use disorder), difficulty interpreting or processing information that occurs during the traumatic event itself, and a history of childhood stress. Having a diagnosable mental health disorder increases the risk that one will also have some type of a substance abuse issue. Moreover, being diagnosed with any form of psychological disorder also increases the risk that one would have a diagnosis of some other psychological disorder. The research regarding comorbidity indicates that between 40 and 60 percent of individuals who are diagnosed with a trauma- and stressor-related disorder also have some type of comorbid substance use disorder. However, the opposite situation is not true, as the majority of individuals diagnosed with substance use disorders do not have a comorbid trauma- and stressor-related disorder. The relationship between substance abuse and a diagnosis of a trauma- and stressor-related disorder is not as straightforward as many individuals assume. Although it would seem logical to assume that when one develops a trauma- and stressor-related disorder, the person will often turn to drugs or alcohol in an attempt to “self-medicate” their symptoms. However, APA and other sources consistently report that one of the risk factors for the development of a trauma- and stressor-related disorder is having a previous history of substance abuse. While it is certainly possible that some individuals begin to use alcohol or drugs in an attempt to cope with their traumatic experience, this is certainly not always the case. The shared liability hypothesis proposes that people who are vulnerable to developing nearly any type of mental health disorder have an increased liability to develop numerous other types of these disorders, including substance abuse issues; most of these vulnerabilities are assumed to be biological in nature but may also include aspects of the person’s experiences. Thus, the bottom line is that individuals who are diagnosed with trauma- and stressor-related disorders are very likely to have a co-occurring substance abuse issue. This means that these individuals require significant considerations during the assessment process and treatment. Not all of the disorders in the category of trauma- and stressor-related disorders are associated with a high risk for substance abuse. Reactive attachment disorder and disinhibited social engagement disorder are diagnosed in children and not typically associated with comorbid substance abuse problems. PTSD, acute stress disorder, and the adjustment disorders can be diagnosed in adults and are more likely to be associated with co-occurring substance abuse issues. Although there are no medications that fully address any of the trauma- and stressor-related disorders or substance use disorders, medications can be extremely useful in the treatment of these disorders. Trauma-related disorders can be treated with various antidepressant medications and anti-anxiety medications. If individuals are experiencing psychotic symptoms (hallucinations and/or delusions), antipsychotic medications may also be used. Recently, the drug MDMA, better known by its street name ecstasy, has also been researched regarding its utility to treat trauma-related issues. Medications alone are not sufficient in the treatment of these disorders. Likewise, numerous medications can be useful in the treatment of individuals with substance use disorders; however, medications alone cannot resolve these conditions. Instead, both medication and the use of some form of behavioral therapy are often needed to address these conditions. Trauma-based treatment approaches will attempt to help the person adjust to the experience of trauma and alleviate the effects of the psychological trauma. These approaches are psychologically based therapeutic approaches that attempt to help the individual understand what happened to them and to learn more about how they are adjusting as opposed to instilling the notion that something is wrong with them. There are numerous types of therapies that can be used to address trauma-related conditions with co-occurring substance use disorders. Cognitive Behavioral Therapy (CBT): CBT used for the treatment of trauma-related issues is often referred to as trauma-focused CBT. Various forms of CBT are also used in the treatment of substance use disorders. CBT is an umbrella term for numerous specialized therapies that combine cognitive therapy (treatment that focuses on an individual’s expectations, beliefs, and attitudes.) and behavioral therapy (therapy that strictly concentrates on changing one’s actions). Self-Trauma Model: The Self-Trauma Model is a blend of CBT, psychodynamic therapy (see below), and other types of psychotherapy. This approach focuses on using CBT techniques to build a positive self-image and also focuses heavily on the relationship between the therapist and the client. 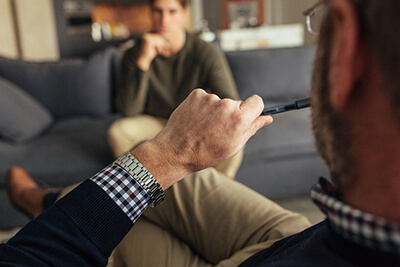 The therapist and the client work through or address issues associated with past trauma and substance use and the therapist provides empathy and feedback to increase the client’s understanding of their issues. This helps the client to adjust and address their issues more effectively. Therapists also provide unconditional positive regard (borrowed from humanistic psychology), a therapeutic attitude where the therapist accepts the individual for who they are despite what they have done or what’s happened to them to facilitate the process. Brief Psychodynamic Therapy: Brief Psychodynamic Therapy is a time-limited approach to therapy based on the principles of Sigmund Freud and his followers. The above models are also time-limited, meaning that the therapist and client work together within a specific timeframe to accomplish their goals. Traditional Freudian analysis can extend for years at a time, whereas brief psychodynamic therapy focuses on specific problems as opposed to addressing the entire personality of the person. It provides techniques based on the Freudian paradigm to help the person adjust to traumatic experiences and address their issues with substance abuse. This type of approach involves much more self-discovery than the above approaches by helping the client to continually reenact the event in order to process it, become familiarized with its effects, and inoculate themselves to the effects of the past trauma. Research has supported this approach for the treatment of trauma and substance abuse. Eye Movement Desensitization and Reprocessing therapy (EMDR): EMDR applies many of the principles of the Cognitive Behavioral Therapy school along with eye movements to help the individual reprocess traumatic events and work through them. Although this technique is still popular, research has indicated that the CBT component is most likely the effective component of the treatment, and the eye-movement component adds little or nothing to the outcome. Nonetheless, because of its concentration on cognitive and behavioral therapeutic techniques and its focus on developing a strong working alliance between the client and therapist, it can be effective. Exposure: The exposure technique originated from behavioral therapy and the treatment of anxiety. Simply having individuals confront anxiety-producing stimuli was found to very often reduce the anxiety associated with the situation or object. Repeated exposure to an anxiety- or stress-producing event (through imagining the event happening, retelling the event, or repeatedly discussing the details of the event with the therapist) can eliminate much of the distress associated with the event. However, simply using mere exposure techniques with very traumatic experiences can be quite dangerous and should only be attempted by highly trained individuals. Systematic desensitization: The use of relaxation and imagery to deal with stress or anxiety has been one of the major platforms of cognitive and behavioral therapies for many years. In systematic desensitization, one is exposed to a traumatic (typically through imagery or retelling) or anxiety-provoking situation while they have achieved the state of relaxation and calm. With this technique, the therapist and client typically develop a list of potentially distressing situations from the least to most distressing and begin the exposure process, while the person is practicing their imagery and relaxation techniques, to the least threatening of these. Once the least threatening situation is mastered, the client and therapist move on to the next level and so forth. Again, this is a technique that can only be effectively and safely applied by a trained professional, but it is often used in many of the above therapies. The client-therapist relationship: A very important working component in any form of therapy is the relationship between the client and the therapist. This is often referred to as the working alliance or therapeutic alliance, and it has been demonstrated to be a major component of success in therapy. Developing a positive and respectful relationship between the therapist and client is extremely important, and most therapists use this relationship. Stress inoculation: Stress inoculation techniques incorporate aspects of all the above techniques but also include elements of positive self-talk, skill building, and other components to help the individual cope with the effects of perceived trauma and with their substance abuse issues. The crucial issue in the treatment of a trauma- and stressor-related disorders and comorbid substance use disorders is that both disorders need to be addressed simultaneously. It is not possible to ignore one disorder and focus on treating the other. The research studies have consistently demonstrated that individuals who have multiple diagnoses need them all to be treated together in order for any of these issues to improve. Thus, the treatment of an individual with trauma- and stressor-related disorder and a comorbid substance use disorder will incorporate aspects of specialized techniques for addressing trauma and substance abuse at the same time. Very often, individuals with these co-occurring disorders will benefit from a combination of individual and group therapy sessions in order to reap the benefits and advantages of both of these approaches. Moreover, these individuals may also find that peer support groups that are not formal therapy groups (e.g., Alcoholics Anonymous) can also be used to assist them on the road to their recovery. Because the effects of trauma and substance abuse can be chronic and pervasive, individuals in treatment for these comorbid conditions often require medical management (supervision from a psychiatrist and prescribed medications), weekly engagement in individual therapy, weekly engagement in group therapy, and attendance in peer support groups. Very often, the treatment for these issues will be lengthy and complicated, but if the individual can maintain their treatment compliance, they will be able to address most of the stress associated with these problems. Fortunately, many of the therapeutic techniques that are used in the treatment of these disorders can be used to address the problems associated with both of the disorders. This helps to streamline the recovery process.